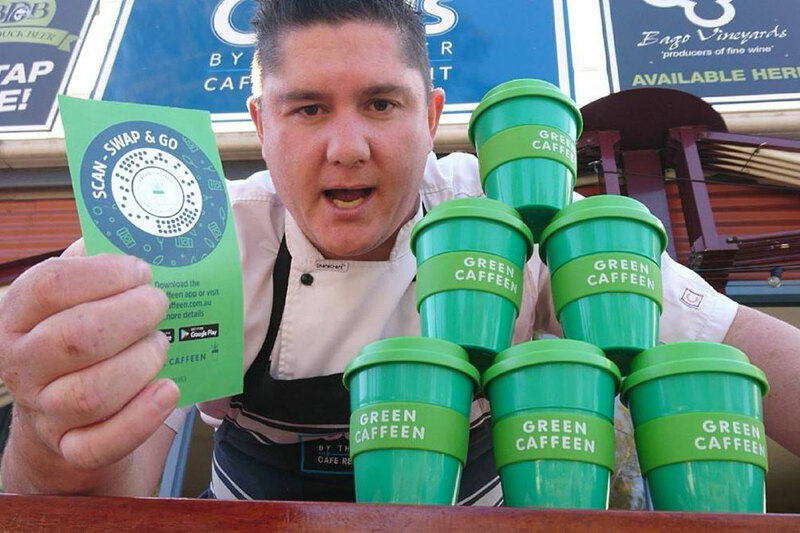 Camden Haven cafes are signing up to a new environmental initiative which aims to reduce the amount of takeaway coffee cups which end up in landfill. Green Caffeen enables customers to visit participating cafes and use a swap and go system for cups. They drink from a reusable cup that can be returned to the cafe and swapped for a fresh cup on their next visit. Top Spot Cafe and Oasis by the River in the Camden Haven have signed up to the initiative. Owner Brendon Lynch said it takes the pressure off people from having to remember to wash their cups after each use. Take away coffee cup waste is an ongoing issue in Australia, with more than one billion cups dumped in landfill each year. The masterminds behind Green Caffeen are Damien Clarke and Martin Brooks. “I’d leave them in the car for days, forget to wash them and end up buying a brand new one. “We thought there had to be a better way." Brendon said people should think of the program as being similar to the ‘swap and go’ gas bottle system at gas stations. “Bring us your empty cup and we’ll refill a clean one for you,” he said. Customers can also secure a clean cup at any participating cafes in NSW. “This makes it handy if people are travelling from here to another destination,” Brendon said.